It’s time to pack the fishing gear and head for Hot Springs, AR. The 8th Annual Hot Springs Fishing Challenge begins 5/1/19 and ends 7/31/19. During that time period, anglers have a chance to catch 71 tagged fish and win $500 to $15,000 per fish! Fish included in the challenge are largemouth bass, bluegill, channel catfish, white bass, and bream. The tagged fish will be released in Lake Hamilton and Lake Catherine in Hot Springs. If you catch an orange-tagged fish, call the phone number on the tag and win your prize. There are 20 fish worth $500, 46 worth $1000, 4 fish worth $5000, and famous “Big Al” is worth $15,000 if caught! Big Al has been elusive in the past challenges. He’s only been caught once, in 2017. If he’s not caught by June 1, a clue will be given out about his whereabouts. Subsequent clues will be given July 1 and July 26 if he’s still not found. Mark your calendars for a free fishing weekend 6/7-9/19. No angler will need a fishing license or trout permit to fish anywhere in Arkansas on those days. Any $500 fish found that weekend will have an added $500 bonus prize! The Fishing Challenge is open to anyone with a valid Arkansas fishing license. Nonresident 3-day licenses start at $16, and can be purchased here. To add even more fun to the event, any angler who shows us their fishing pole or license will get a chance to “Catch a Deal”! 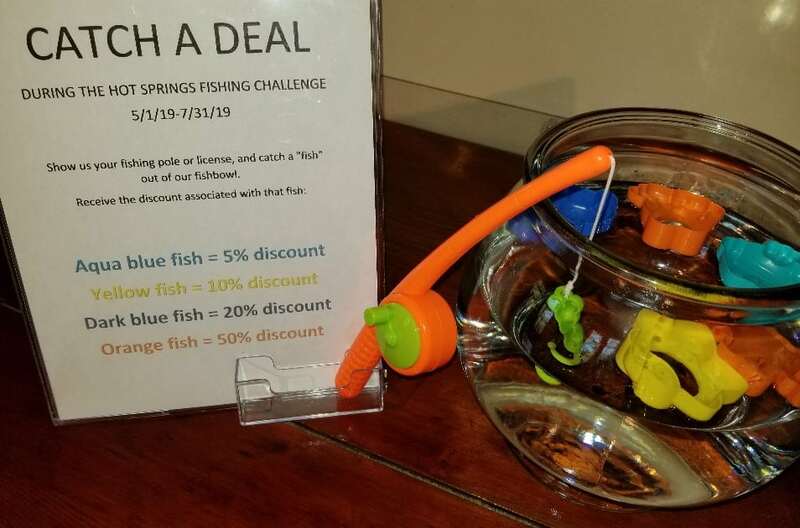 Catch a “fish” out of our fishbowl, and receive the discount associated with that fish (discounts range from 5% off to 50% off each night of your stay). We also now offer a “breakfast to go” option for anyone who wants to get an early start on their fishing. We’ve got room to park your boat, and after a day on the lake, you can relax on our front porch with your favorite cold beverage, or explore our 60+ acres of woods surrounding Tiffany’s bed and breakfast. According to Arkansas wildlife fishing reports, fishing in West-Central Arkansas is heating up. Join us for a chance to catch a deal AND possibly catch some cash on your next visit to our Hot Springs area bed and breakfast! This entry was posted in Events, Hot Springs Attractions, things to do in Hot Springs by admin. Bookmark the permalink. There is nothing like fishing in Arkansas! We are blessed with such beauty. I actually went to school with the guy who caught “Big Al”, and he couldn’t be a nicer guy. My go to lake is DeGray Lake. Love catching hybrids and whites. Such a great fight! But these money fish could just “lure” me their way! Of course DeGray lake is closer to Tiffany’s Bed and Breakfast, but while you’re here don’t want to miss your chance of meeting “Big Al” or his friends. Take advantage of having so many lakes so close to you and enjoy breakfast before you do! And since you’re guaranteed to “catch a good deal” fishing at Tiffany’s, you can extend your stay. You’re right, Melissa; the Hot Springs area is a fisherman’s paradise!